Learn to make Mint Dough with Marc Vetri's newest cookbook, 'Mastering Pasta'. This recipe is similar to the basic Egg Yolk Dough but with a little more flour and egg to bind up the herbs. Like that dough, it makes enough for 4 sheets of pasta that are 5 to 6 inches wide, each 4 to 5 feet long if rolled to 1/32-inch thickness; 3 to 4 feet long if rolled to 1/16-inch thickness; and 2 to 3 feet long if rolled to 1/8-inch thickness; and 2 to 3 feet long if rolled to 1/8-inch thickness. Have ready a bowl of ice water. Bring a large pot of water to a boil. Add the parsley and mint and blanch it until it is bright green, about 15 seconds. Using a spider strainer or slotted spoon, immediately transfer the mint and parsley to the ice water to stop the cooking. For a dough with a deep green color, reserve about ¼ cup of the blanching water and let it cool. When the parsley and mint have cooled, remove them from the ice water and shake off the excess water. Transfer the parsley and mint to a blender, small food processor, or mortar and pestle, add the oil and 1 tablespoon fresh water – or 1 tablespoon of the blanching water- and puree the mixture until smooth. The finer you puree the mixture, the fewer specks you’ll have in the pasta. Transfer the mint and parsley puree to a stand mixer fitted with the paddle attachment and add both flours and the egg yolks. Or, mix the flours on a work surface, make a well in the center, then add the egg yolks and parsley puree, mixing with your fingers. Mix on medium speed for 2-3 minutes, adding fresh water or the cooled blanching water, 1 tablespoon at a time, until the dough comes together. You should only need 1 to 3 tablespoons of water. Turn the dough out onto a lightly floured work surface and knead it until it feels silk and smooth, about 5 minutes, kneading in a little flour if necessary to keep the dough from sticking. The dough is ready if when you stretch it with your hands, it gently pulls back into place. Shape the dough into a ball, then flatten the ball into a disk. Cover and set aside for at least 30 minutes or wrap it in plastic wrap and refrigerate it for up to 3 days. You can also freeze it up for to 3 months. Thaw the dough overnight in the refrigerator before using it. Alternatively, thaw it in a microwave oven on 50 percent power in 5-second increments, just until cool to the touch. To roll out the dough, cut it into 4 equal pieces. If you have a very long work surface, you can cut the dough into fewer pieces. Let the pieces sit, covered, at room temperature for 10 minutes if chilled. The dough should be cool but not cold. Shape each piece into an oval wide enough to fit the width of your pasta roller. Lightly flour your work surface and set the pasta roller to its widest setting. Lightly flower 1 piece of dough, pass it through the roller, and then lightly dust the rolled dough with flour, brushing off the excess with your hands. Pass the dusted dough through the widest setting again. Set the roller to the next narrowest setting and pass the dough through, dusting again with flour and brushing off excess. Pass once again through the roller. Fold the dough in half lengthwise over itself ad cut about ¼ inch off both corners at the fold. This folding and cutting helps to create an evenly wide sheet of dough. Continue passing the dough once or twice through each progressively narrower setting. For thicker pasta like corzetti, chitarra, pappardelle, fettuccine and tagliatelle, you generally want to roll the dough about 1/8 inch thick – setting 2 or 3 on a KitchenAid attachment— or about as thick as a thick cotton bedsheet. For sheet pastas like lasagna and cannelloni, you want to roll it a little thinner still, about 1/16 inch thick – setting 4 or 5 on a KitchenAid attachment or about as thick as a thin cotton bedsheet. 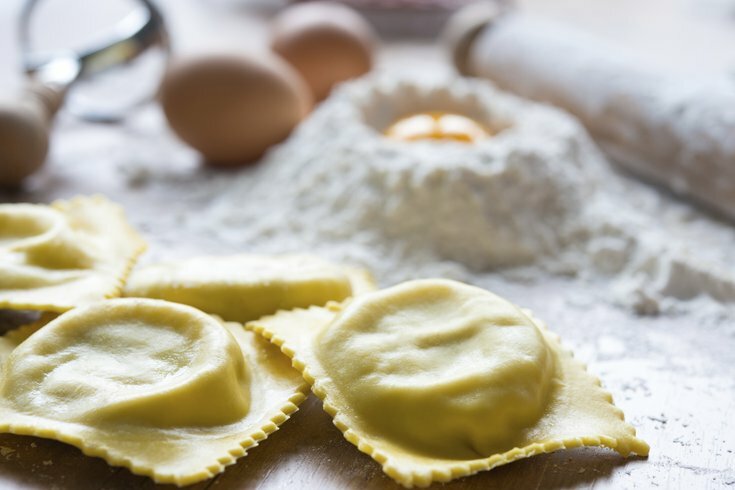 For ravioli, you want to roll the pasta a little thinner, to about 1/32 inch thick or setting 6 or 7 on a KitchenAid; ravioli sheets should generally be thin enough to read a newspaper through. As you roll and each sheet gets longer and more delicate, drape the sheet over the backs of your hands to easily feed it through the roller. You should end up wit ha sheet 2 to 5 feet long, 5 to 6 inches wide, and 1/8-1/32 inch thick, depending on your roller and the pasta you are making. To cut the pasta sheet into the pasta shape for the dish you are making, lay it on a lightly floured work surface and use a cutting wheel or knife, or use the cutter attachment on the pasta machine. If you want to hold the pasta after cutting it, dust it with flour, cover it, and refrigerate it for a few hours, or freeze it in a single layer, transfer the frozen pasta to zipper-lock bag, and freeze it for up to 1 month. Take the pasta straight from the freezer to the boiling pasta water.